While Google has been working on an operating system for some time now, I haven’t seen any response about the Chrome OS since Google released Chromebook in June. If you aren’t familiar with their new device, I will give you the solid info here. Unlike a netbook, which carries some similarities to a Google’s new device, the Chromebook is not a miniature Microsoft Window’s laptop. Google built the Chrome Operating System with speed in mind. In fact the device only takes about 8 seconds to start up, and resumes instantly from sleep. It weighs only 3.2 – 3.3 pounds and features a bright 11.6 – 12.1 inch screen, depending on version. To top it off, the Chromebooks feature super fast 16 GB solid-state drives. Before you have a cow about the drive size, you should know that one of the main focuses for Google is creating an environment where information is stored in the cloud instead of local disks. While this concept has its pros and cons, it does protect your data from hardware failure and also makes it available anywhere, which are 2 really big pluses. 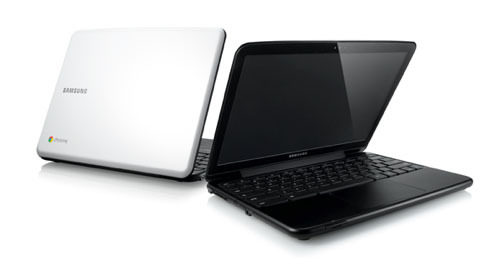 The internet connectivity is built-in like the iPad, with Wi-Fi (Wireless-N) and 3G versions available from the 2 current manufacterers- Acer and Samsung. Acer offers the slightly smaller, lighter version. All the Chromebooks feature a 6 cell battery that will last up to 8.5 hours, thanks to the power-saving design of Chrome OS. While Google mentions it’s extensive security continuously, the jury will probably remain out on that for some time. It’s easy to call something secure when tens of thousands of people aren’t trying to hack it everyday (yet). Chromebooks are available from Acer and Samsung right now, with both offering a Wi-Fi and a 3G version. The Acer 3G is $80 more than the Wi-Fi only version, while Samsung offers 3G for $70 more than it’s Wi-Fi version. What is the difference between Acer and Samsung Chromebooks? Aside from the price, the Samsung Chromebooks offer a mini-VGA port where as the Acer Chromebooks have an HDMI port. Samsung also advertises 6% longer battery life at 8.5 hours compared to 8 and boasts about its brighter screen. Having sold Samsung flat panels for years, I can vouch for their quality. They manufacture their own panels in a plant that is jointly owned by Sony and those 2 companies have consistently put out the best looking flat panel displays over the last decade. Whether the improved screen and minimally longer battery life is worth the price difference is debatable, but Samsung will no doubt succeed on its quality brand name. You can check out Chromebooks at Best Buy or Amazon.com .